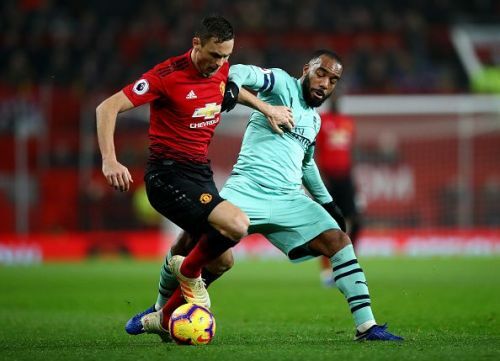 With the Manchester United match ending in a draw, Arsenal ended up fifth in the Premier League rankings after the midweek match. Fortunately for Unai Emery's team, the Gunners will face a much easier opponent on Saturday. Their opponent, Huddersfield, sit 17th in the table and have scored just 10 goals thus far. In comparison to the rest of the league, the number of goals scored by the Terries is the least at the moment. Thus, this should pose less of a worry to the vulnerable Arsenal defence line which is also in the midst of an injury crisis. Emery's men remain unbeaten in 20 consecutive games and look to continue that streak this weekend when they host the match at the Emirates Stadium. In light of the recent serious-looking injury to Rob Holding, Emery will be forced to reassess his starting line-up. Luckily, both Nacho Monreal and Laurent Koscielny do not seem far from making their return from injury. The two veteran defenders will offer Emery some hope even though the latter is not expected to play for the first team until the Europa League match against Qarabag. After using a 3-4-3 formation with great success, Emery might return to a 4-2-3-1 formation after the injuries to his defenders and midfielders. This formation would bring greater stability to the team even though it may limit their creativity and attacking threat. Here is how they could line-up against David Wagner's men. As much as Leno is showing difficulties in dealing with set-pieces, he looks comfortable playing the ball from the back and is always on alert when defenders make a back pass. 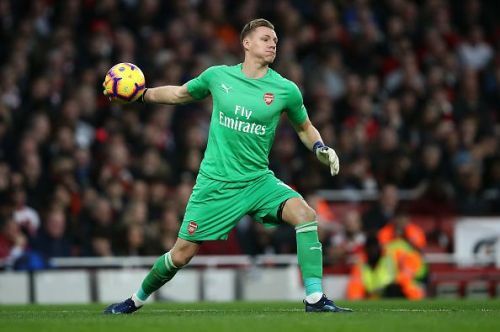 Leno is hardly showing any signs of losing his place to Petr Cech and he is likely to remain between the posts this weekend. 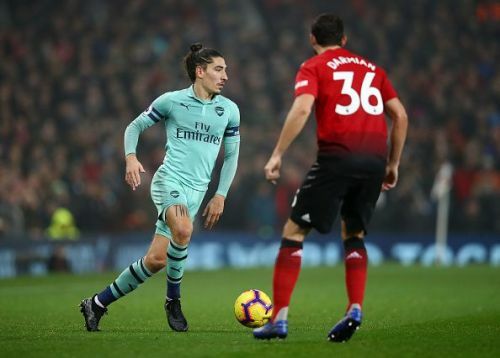 Bellerin is enjoying a wonderful season under Emery who allows him to express his creativity in the opponent's half. The Spaniard is extremely good at charging down the flanks and looks more threatening when he plays as a winger. However, with the injury to Holding, Emery could be tempted to switch to a back four to ensure greater stability at the back and that's where Bellerin would have to be more aware of his defensive duties as a full-back. With Koscielny still on his way back from injury, the Greek defender will be starting with Mustafi without any doubt. 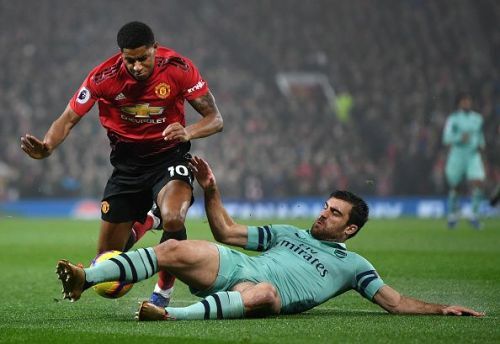 Although he has been unable to help his side keep clean sheets, Sokratis has been doing great with his accurate and timely tackles. He has been setting a good example for less experienced defenders such as Holding and Mustafi so far. He scored with a header against Jose Mourinho's team and this showed that he can be an aerial threat in his opponent's penalty box. With no one else available, Mustafi will be playing with Sokratis. 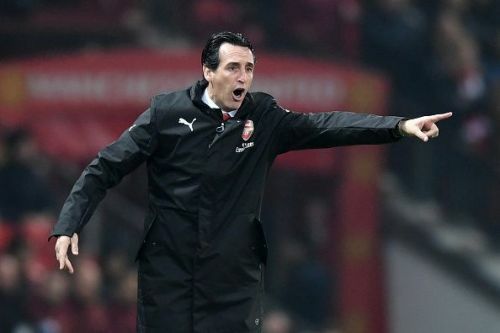 Even though he made a mistake which resulted in Manchester United's second equaliser of the night, Emery has continued to back Kolasinac. As Monreal steps up his recovery, Kolasinac has shown why he can play a vital role in the starting eleven. He is far more aggressive and poses a greater threat in the final third as compared to the Spanish international. Given his talents in attack, it could help him retain his place ahead of Monreal. Xhaka served his suspension after receiving his fifth yellow of the season and will now be back in contention to start. 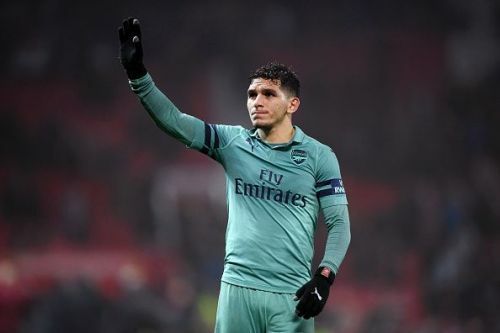 The partnership between him and Torreira has been so effective that it was greatly missed during Wednesday night's game. Through the draw with the Red Devils, fans realise his importance and the balance which he can bring to the team. Hence, the Swiss international is expected to receive the nod from Emery to start with Torreira once again. 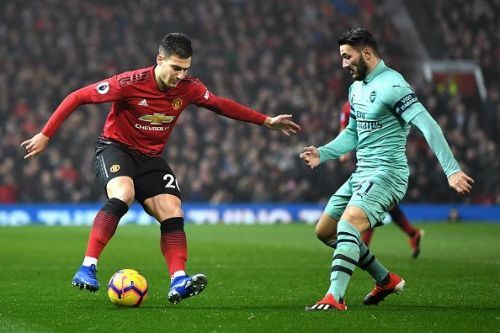 The Uruguayan was once again at his best when he played for the first time as an Arsenal man at the Old Trafford. The Arsenal fans love their tiny magician and the manager knows that if he wants his team to beat Huddersfield, Torreira would have to start. His man-of-the-match performance in almost every game in recent weeks goes to show that the Gunners cannot do without him. His ability to recover the ball quickly and make interceptions have been important for the Gunners in controlling the game and dominating it especially in the second-half. 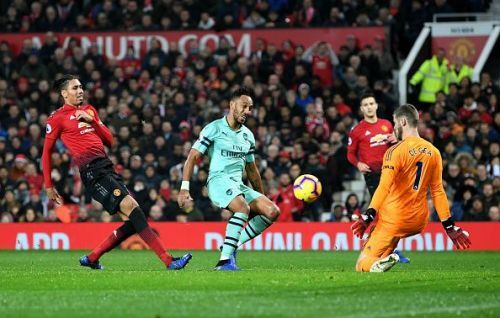 There had been plenty of talk about Aubameyang's shots on target being saved by David de Gea during the Manchester United match. Nonetheless, the Gabon international is one of the most lethal strikers in the Premier League. With Huddersfield struggling to find goals, Aubameyang could provide the Gunners with the goals on the other end. He is currently the top scorer in the league and has every ounce of confidence to make his strike count. With Mesut Ozil and Aaron Ramsey dealing with their respective injuries, Arsenal will be lacking some sort of creativity in the team. Perhaps, Emery could turn to Iwobi who played only the first 45 minutes of the midweek match. The Nigerian has been superb as a substitute in the early stages of the season, but somehow he has not been able to quite deliver what is expected of him in recent matches. With no one else to turn to, Mkhitaryan is set to start against Huddersfield due to the injuries to the midfielders in the team. Comparisons have been made between Alexis Sanchez and himself, but both players have been incapable of replicating their previous successes enjoyed in their careers. At times, Mkhitaryan's passes appear to not be in-sync with the rest of the team and he offers little when it comes to defending. However, the Armenian has actually been brilliant in the Europa League. He has to bring that sort of confidence and calmness into his games in the Premier League. The French star started on the bench in the previous two games as Emery chose to go ahead with a lone striker, Aubameyang. Lacazette has time and again showed his importance and ability to score in big matches. As such, he should be rewarded with a start against Huddersfield. His understanding with Aubameyang has been amazing thus far and Emery should utilise that to make an impact on the game as early as possible.